The Wolves were able to force three turnovers last week in their 29-27 victory over Garrison. The San Augustine offense relied on a stable of running backs to carry the load, led by junior Tijay Thomas. Thomas finished the game with 27 carries for 133-yards and one touchdown; he was also 5 of 7, 104, 2TD through the air. Junior WR JaVarious Miller hauled in both touchdown receptions. The Tigers sent shockwaves across the state last week with their 35-14 victory over previously undefeated #7 Carlisle. Tenaha is no stranger to the playoffs and that experience can be displayed throughout their roster. Junior QB Hayden Jenkins Jr. (135-of-228, 2,509 yards, 28TDs) and senior WR Jay Lloyd Sr. (219 carries, 2,132 yards, 25TDs; 21 receptions, 3TDs) have been a nightmare for defenses this season. The game will be a rematch from non-district play, where Tenaha won 14-0. Kickoff is set for 7:00 p.m. Thursday at Dragon Stadium in Nacogdoches. The Tigers crashed the party for #9 Gladewater last week 35-7, it was their second victory in a row over a top 10 opponent. Malakoff has improved on the defensive end in all three playoff games. During bi-district they gave up 35-points to Pottsboro, during area they gave up 21-points to Jefferson, and last week just 7. The Rabbits forced four turnovers last week, that led to a 38-14 victory over Mount Vernon. Atlanta had two running backs finish the game with over 100-yards on the ground. Caleb Hamilton rushed for 105-yards, while Jawan King had 100-yards and three touchdowns. 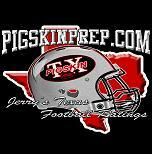 The game is scheduled for 7:30 p.m. Friday at Pine Tree Stadium in Longview. The Lions used a goal line stand to defeat district foe Van 21-20 last week. Henderson was defeated by Van during district 21-20 and returned the favor this go around. Keshoyn Alexander was the only Lion to score an offensive touchdown and finished the game with 7 carries for 90-yards. Pedro Garza provided the other Henderson score on a 86-yard pick-six. The Bulldogs faced their toughest test of the season last week, but survived Midlothian Heritage 50-49 in double overtime. Carthage called on QB Gunner Capps to lead the charge, and he delivered. Capps finished the game 24 of 36, 405-yards, 5TDs. These two rivals are meeting in the quarterfinals for the third consecutive season and Henderson is looking to advance this time. The game is scheduled for 7:30 p.m. Friday at Lobo Stadium in Longview. Cujo used a big game from senior QB Devlen Woods to defeat Frisco Lone Star last week 31-13. Woods finished the game with one passing touchdown, one rushing touchdown, and 200-yards of total offense. The Scots destroyed Mansfield Timberview last 52-0 and extended their winning streak to 28-games in the process. Junior QB Chandler Morris was 17 of 23, 266-yards, and 3TDs through the air and he had 5 carries for 22-yards and one touchdown. The key to this game will be whichever defense can force the most turnovers and punts. Kickoff is set for 1:00 p.m. Saturday at The Star in Frisco. The Lobos pulled away from Austin Vandegrift in the second half last week and delivered the Vipers their only loss on the season 56-28. Junior QB Haynes King showed why colleges are lining up for his services, with a five touchdown performance. King was 13 of 16, 248-yards, 3TDs through the air and carried the ball 16 times for 93-yards and two touchdowns. The Mustangs ended the season for Mesquite Horn 35-16 behind a rushing attack that put up 311-yards on the ground. Senior RB Rayshawn James (15 carries, 171-yards, 2TDs) set the tone and the Westfield defense was able to come up with two clutch interceptions. The game is scheduled for 2:30 p.m. Saturday at WISD Stadium in Waco. Contributions are not required but are greatly appreciated!